Free PowerPoint Password Recovery software can quickly recover your lost or forgotten password for PowerPoint. It supports all versions of Microsoft Office PowerPoint including PowerPoint 2019, 2016, 2013, 2010, 2007, 2003, 2000 (.PPT, .PPTX, .PPS, .PPSX). 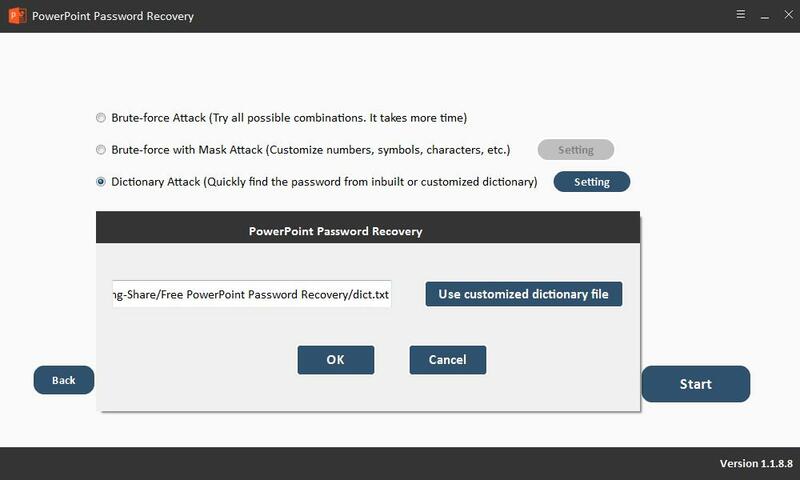 3 efficient PowerPoint password attack options help you recover PowerPoint password: Brute-force Attack, Brute-force with Mask Attack and Dictionary Attack. Brute-force Attack will try all possible characters combinations which take more time. If you remember part of password you've set, Brute-force with Mask Attack is highly recommended. It will shorten the password searching time and find your PowerPoint Password effectively. 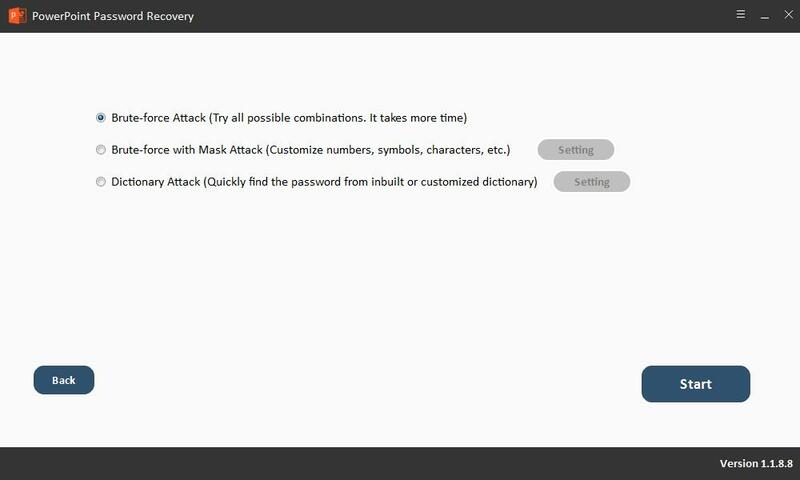 Dictionary Attack can find PowerPoint Password from built-in or self-created dictionary. 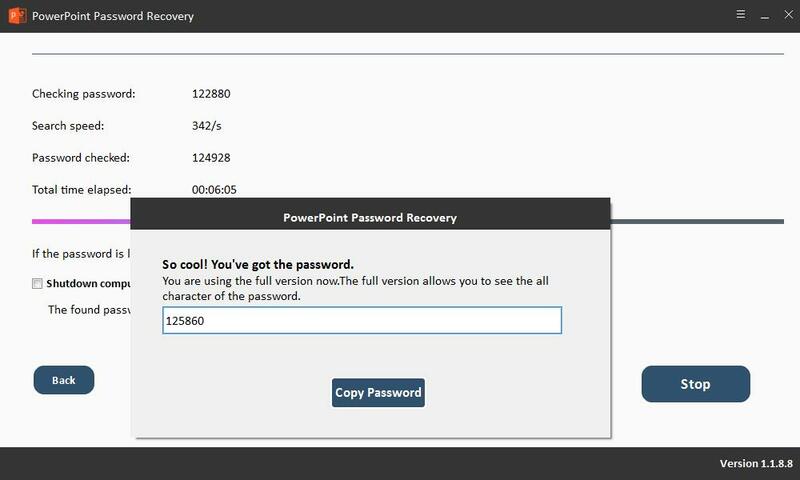 Free PowerPoint Password Recovery software is easy to use. The password search speed is fast. If the password search process is not completed due to a sudden stop of the password search or software crash, it will automatically save the PowerPoint password recovery progress project. It is optional to shutdown computer automatically after PowerPoint password recovery and the found password will be saved in the folder named "Password" in the installation directory. 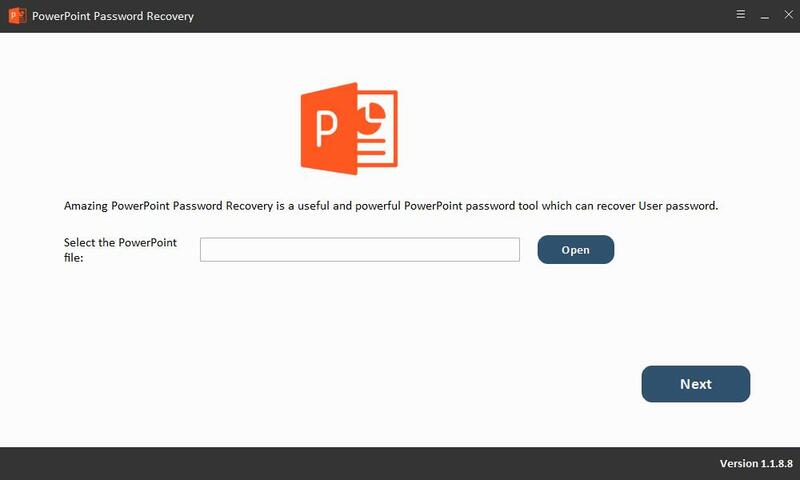 3-step to recover forgotten password to open PPTX/PPT file: launch Free PowerPoint Password Recovery software on your computer and import PPTX/PPT file, select password attack type and then begin to recover your lost Microsoft PowerPoint password. Xanthe - This is the best PowerPoint Password Recovery. It took 2 hours to recover my forgotten password finally. Ruth - It owns user-friendly interface with powerful features.